If internal data centres integrate at an infrastructure level, why is the cloud market not looking to emulate the same infrastructure model and allow both private and hosted services to integrate deeply – creating an extension to the internal cloud infrastructure? Why can’t hosted and private clouds be built on the same solutions and be deeply integrated? 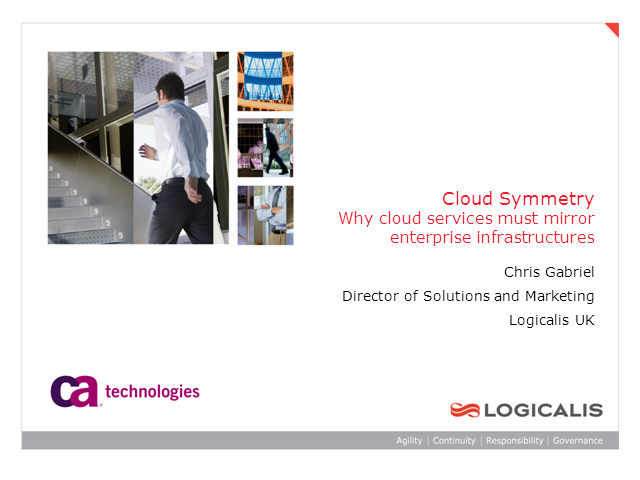 Logicalis Cooperative Enterprise Cloud is a fully matched private and hosted hybrid cloud service, leveraging a single infrastructure and management tools set to create a cloud environment that can truly be considered a strategic enterprise cloud platform. Chris Gabriel will review the key building blocks behind the cloud architecture, strategy and service, and demonstrate that through innovative use of enterprise technologies from Cisco and CA Technologies, a cloud whose security and services levels are not based on a credit card and a prayer.